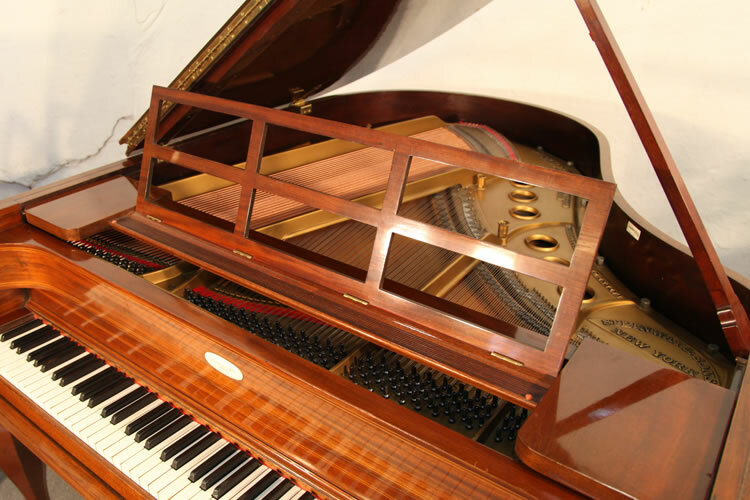 A Biedermeier style, Steinway Model M grand piano with a french polished, mahogany case and stringing inlay. 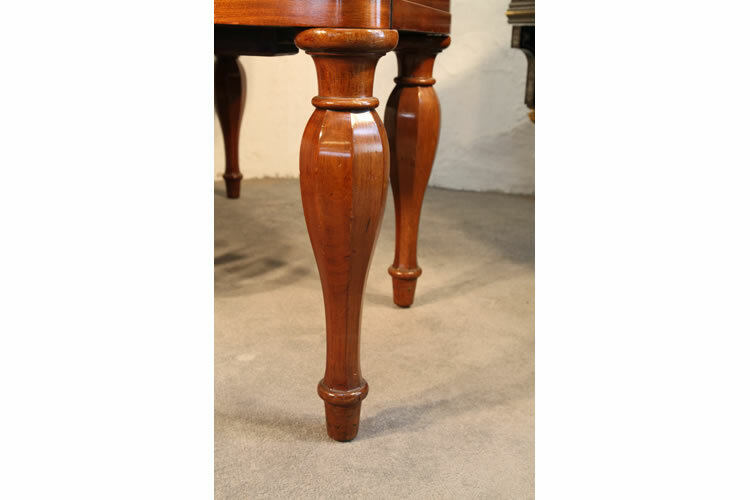 Piano has five baluster legs. 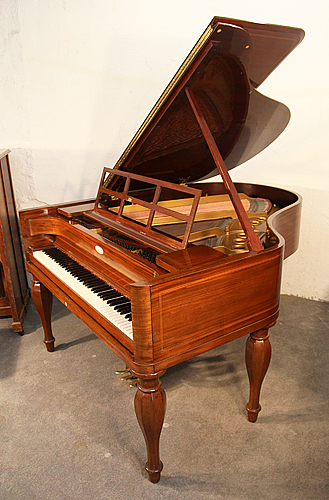 Design based on the first piano made by Heinrich Steinweg in 1836. The piano has high cheeks with a folding lid with the appearance of a square piano from a front view. Instrument in original condition. 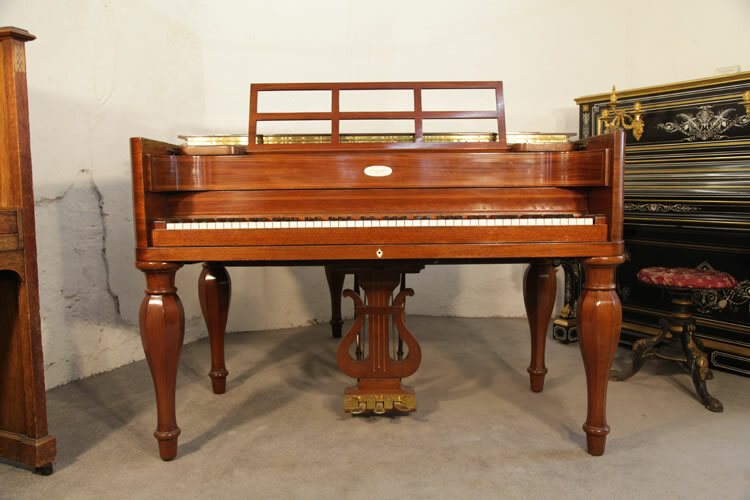 Heinrich Engelhard Steinweg first made pianos in 1820s from his house in Seesen, Germany. He made pianos under the Steinweg brand until he emigrated from Germany to America in 1850 with his wife and eight of his nine children. The eldest son, C.F. Theodor Steinweg, remained in Germany, and continued making the Steinweg brand of pianos, partnering with Friedrich Grotrian, a piano dealer, from 1856 to 1865. In 1853, Heinrich Engelhard Steinweg founded Steinway & Sons in the Manhattan district of New York City. Biedermeier is a style of furniture design from Germany from the period 1815–1848. It is based on utilitarian principles and emphasis was kept upon clean lines and minimal ornamentation. 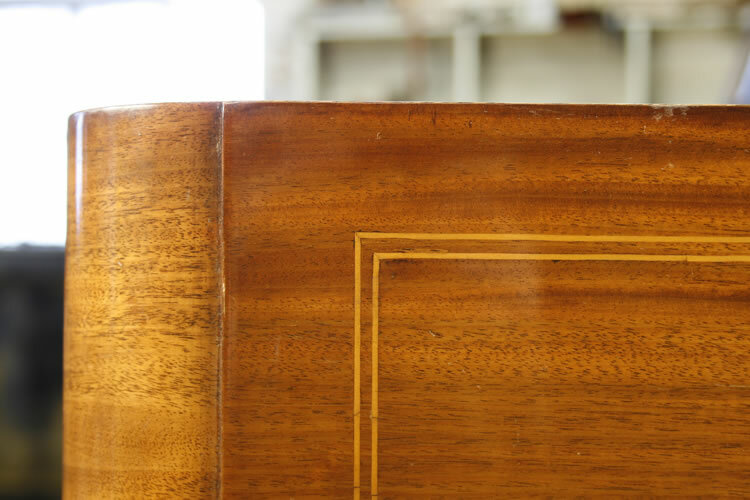 Biedermeier furniture was the first style in the world that emanated from the growing middle class. It preceded Victoriana and influenced mainly Germanic-speaking countries. As the period progressed, however, the style moved from the early rebellion against the overly ornate Romantic era to increasingly extravagant commissions from a rising middle class, eager to show their newfound wealth. Steinway open work music desk. 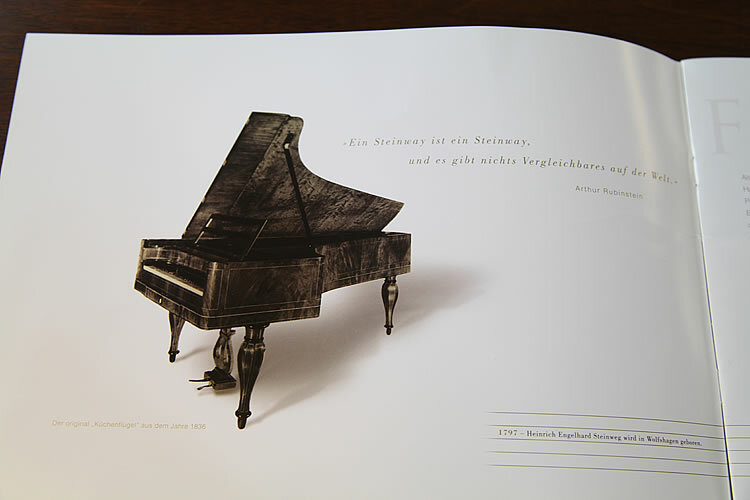 Image from a Steinway catalogue "Von der No.1 Bis heute" which translated means from the first to today. 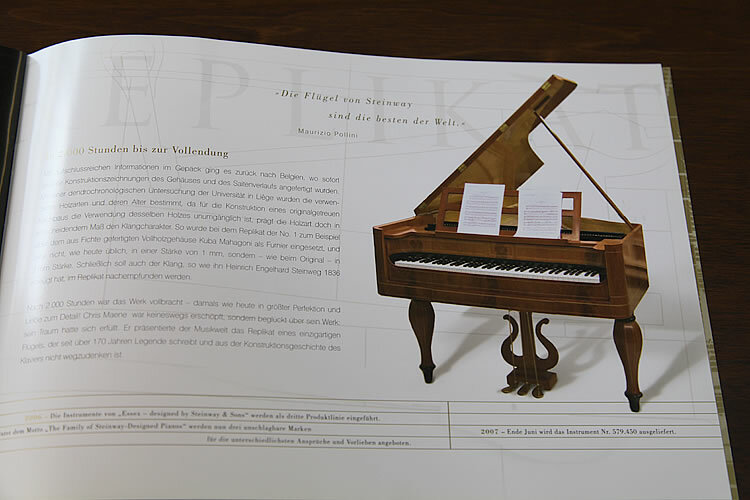 The catalogue explains the history of this piano design. From the front, the lid of this Steinway Model M folds down like a square piano. 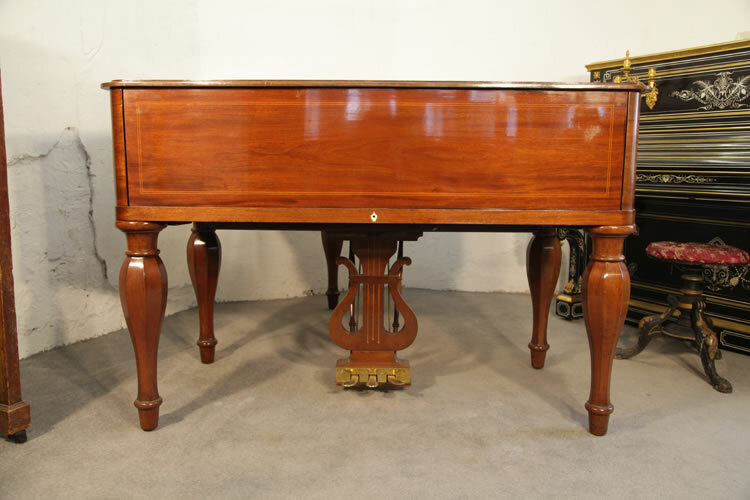 True to Biedermeier style, this piano has very little ornamentation. This keyhole escutcheon is a tiny ornate detail. 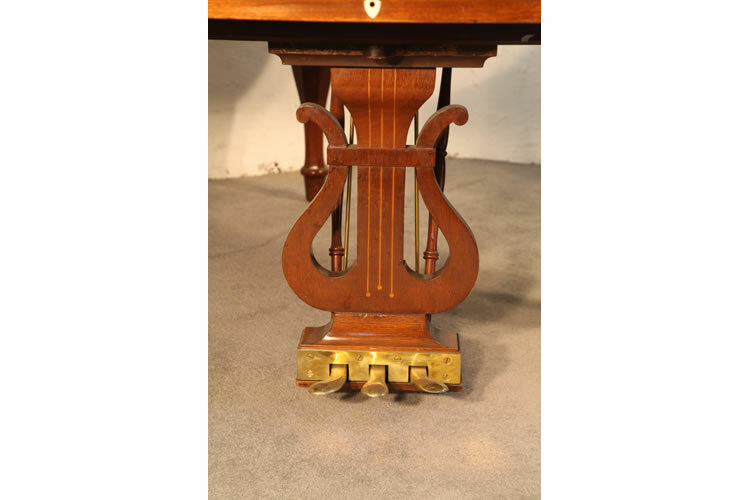 Front view of this Steinway model M piano showing the five baluster legs, high piano cheeks, open work music desk and traditionally shaped piano lyre. 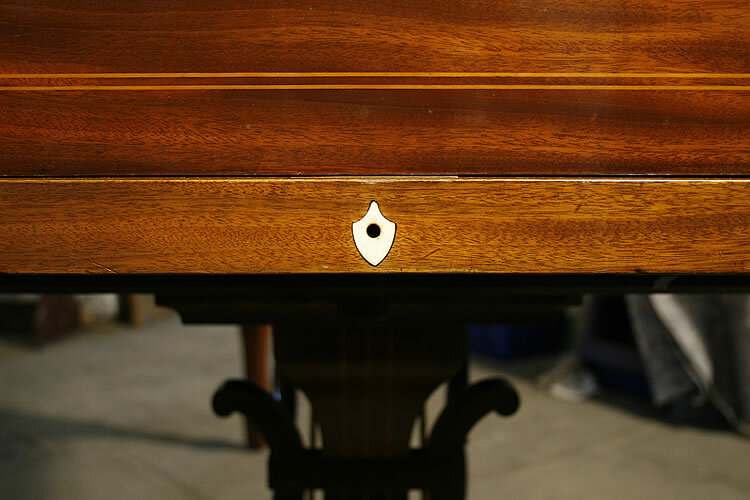 Steinway model M satinwood stringing inlay detail. 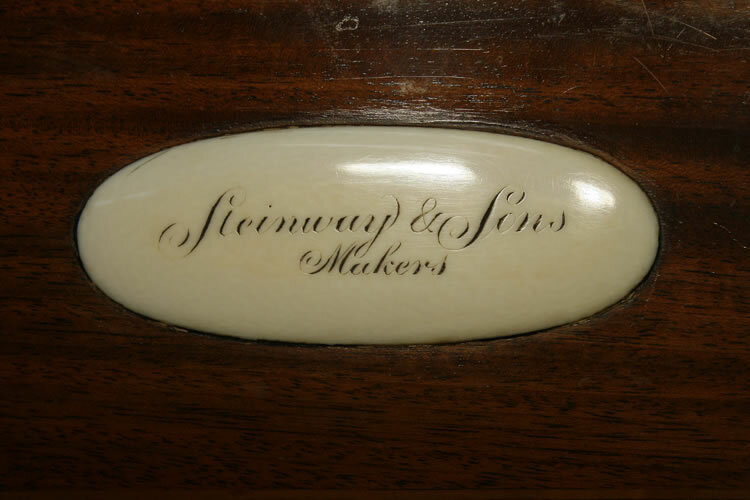 John H. Steinway offers a history of the Steinway family and the early days of Steinway & Sons in New York City. The lecture was held at the Astoria Historical Society in Astoria, Queens, February 1979. 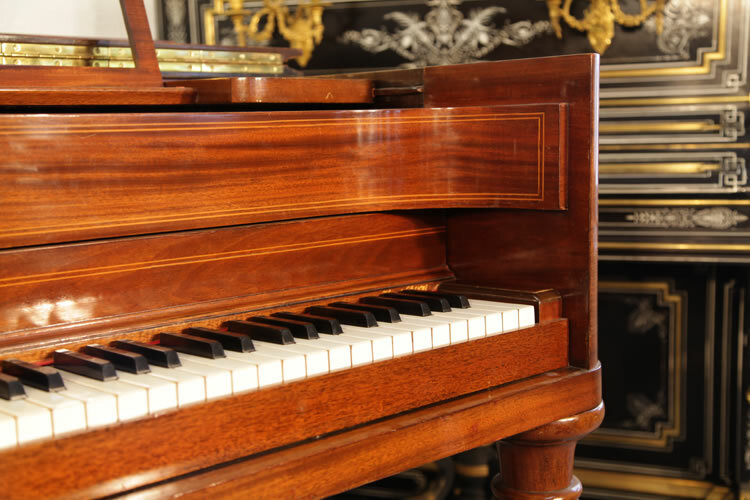 Fancy taking a look around our piano showroom? Now you can with Google Business View. Click on the image below to navigate around our showroom. Click on the numbers bottom right to jump to different floors in our premises. The pianos on this website are on display in our Leeds showroom, ready to play. 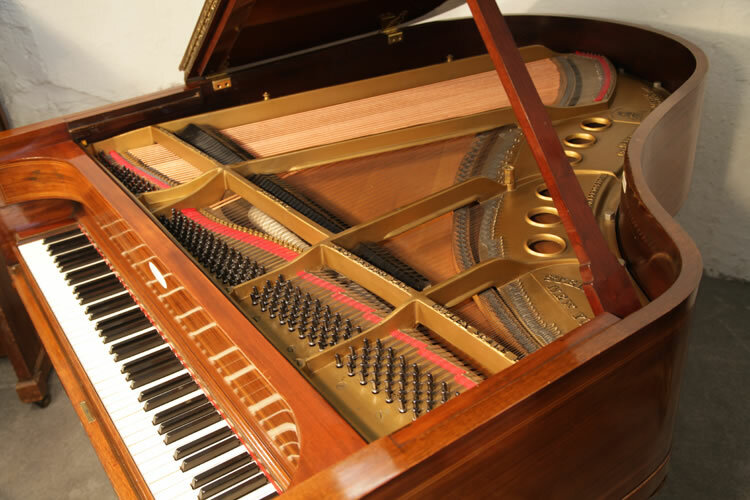 If you are interested in trying any of our pianos, click here for directions how to find us. If you require buying advice, we recommend making an appointment before coming down to the showroom. This ensures we can offer you the best customer care available.